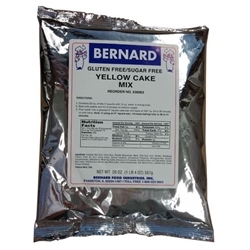 Bernard Bakery Mixes use Enriched Rice Flour, making them 100% gluten free, and are sorbitol and Stevia sweetened. 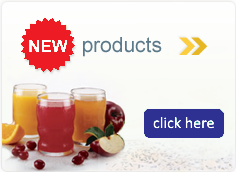 These mixes contain no artificial ingredients and enable those with gluten intolerance who may need or enjoy reduced sugar in their diet, to enjoy delicious cakes and brownie products without dietary complications. Combine 20oz. of mix (1 pouch) with 10 oz. water in mixing bowl. Beat with paddle arm for 3 minutes on medium speed. Pour batter into a greased 9" square cake pan and bake at 350° for 33 to 38 minutes or until done. Note: If using an 8" squar pan, increase baking time to 36 to 41 minutes. Ingredients: enriched rice flour (rice flour, thiamin mononitrate, niacin, folic acid, iron), sorbitol, shortening powder (palm oil, corn syrup solids, sodium caseinate, dipotassium phosphate, monoglycerides, sodium silicoaluminate), maltodextrin, whole egg solids, monocalcium phosphate, emulsifier (mono and diglycerides, nonfat milk solids, modified corn starch), egg white solids, sodium bicarbonate, salt, natural flavor, xanthan gum, stevia extract (rebiana).